Books! Ever since I learned to read I REALLY loved books. So I started writing my own (they were comic books) when I was nine years old. Then I tried writing a novel when I was eleven or twelve, but I gave up after about 30 pages. But it didn’t put me off reading and writing, and in the back of my mind I decided I’d try writing more books when I was an adult. And that’s what happened! I’m really lucky because what started as a hobby when I was a child became my job as an adult. I wrote my first book — a cartoon about my pet turtle named Bubble — when I was nine years old. But it was never published! Anything that interests me or catches my attention can lead to a story, a book or a sub-plot for a book. It could be an article I read in the newspaper, something interesting I see while I’m taking my dog for a walk, or even a line from a song. But the best ideas spring from my imagination. I’ll look at something quite ordinary and my brain will go ‘Ping!’ and turn it into a story idea. Phoebe Nash Girl Warrior is about an ordinary girl in extraordinary situations. Is it more important to write about what you know or imaginary situations? Start with what you know. I had recently been to Africa, so I didn't need to imagine too much about the landscape, people or animals that Phoebe encountered. If I had never been to Africa I would have had to do heaps of research. I always use a computer. I’m a compulsive rewriter and am always editing and changing bits that I wrote the day before, so if I wrote by hand I’d use about 10,000 sheets of paper to write a single book. I write every weekday (unless I’m away visiting schools or libraries) from 8.00 am till 1.00 pm. What are your favourite tricks when you run out of ideas or have writers block? Make something happen! If I'm stuck or my story is getting boring, I make someone's mobile phone ring, or introduce a new interesting character, or confront my characters with an elephant or a snake or a large savage dog! I always have a pen and paper handy. When I was in Africa researching Phoebe Nash Girl Warrior, I filled six exercise books with notes and ideas. Of all the books you’ve written, which is your favourite? That’s like asking a parent who’s their favourite child. They’re all my favourites, for different reasons. Never. But often I use characteristics of real people when developing characters. Where do you get your characters’ names? Sometimes I use the first - or last - names of people I meet (though never both together) - if the names suit my characters. My first publications were cartoons and articles in motorbike magazines. Then I wrote an adults’ novel, called ‘The Initiate’ that was published in 1989. I started writing for children and young people in 1995. My first children’s book, ‘Infamous’, was published in 1996. Do you have any advice for someone who wants to become an author? Read, read, read, write, write, write. Being an author is just like any other job: you have to serve an apprenticeship. Never stop reading and never stop writing. It might take years before your first story is published, but the most important thing is you must enjoy writing them. If you don’t enjoy reading and writing you will never be an author. I don’t have a single favourite author, I have hundreds! When you read as many books as I do it’s impossible to have a favourite. The author of every new book I read is my favourite until I finish it and start another one. Are there any other authors in your family? 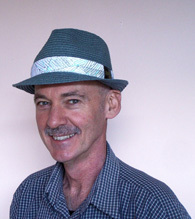 My cousin, Ted Dawe, is a successful YA author in New Zealand. Reading, bushwalking, seeing new places. I’ll be turning 115 on 4 October 2068. You’re all invited to the party. My grandchildren reckon I’m a bit goofy! At any good book shop (and most bad ones, too). The problem with my books is they are so popular that they often get sold within a day or two of arriving in a book shop; so you’ll go to buy one and it won’t be there. Here’s what to do: simply go to the counter and ask the bookseller to order a copy for you — it’ll take about a week to arrive. Will you come to my school or library? Favourite book by another author: The Jungle Book, by Rudyard Kipling. Favourite food: Incredible Bean Pie. Favourite movie: The Three Amigos. Favourite TV show: Wildlife documentaries. Favourite day of the week: Saturday. Favourite ice cream flavour: Pumpkin. Least favourite ice cream flavour: Chocolate chilli.